The John Jay Community 5k Trail Race is a community race on the new John Jay Community Cross Country Trail. It is open to runners and walkers of all speeds and abilities. In 2019 we added a 200 meter Kids Jay Dash and a 4K Jay Walk to include all ages and abilities in the day’s events and encourage everyone to explore the new trail system. We have a frequently asked questions page here. The course starts on the lower fields of the John Jay Campus and quickly goes into the wooded trails adjacent to the middle school and high school. The trails are challenging and hilly in the woods. The course ends at the John Jay Contest field. 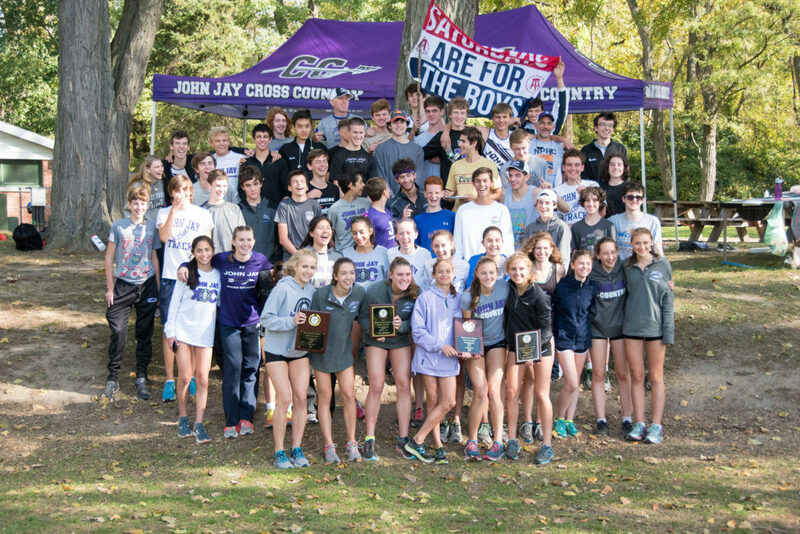 The cross country trail has been developed and built by student and community volunteers to provide a home course for the Westchester County and New York State Champion John Jay Cross Country teams as well as for other athletic teams, academic access, and the community. The first 150 pre-registered runners/walkers to sign up receive a race t-shirt! 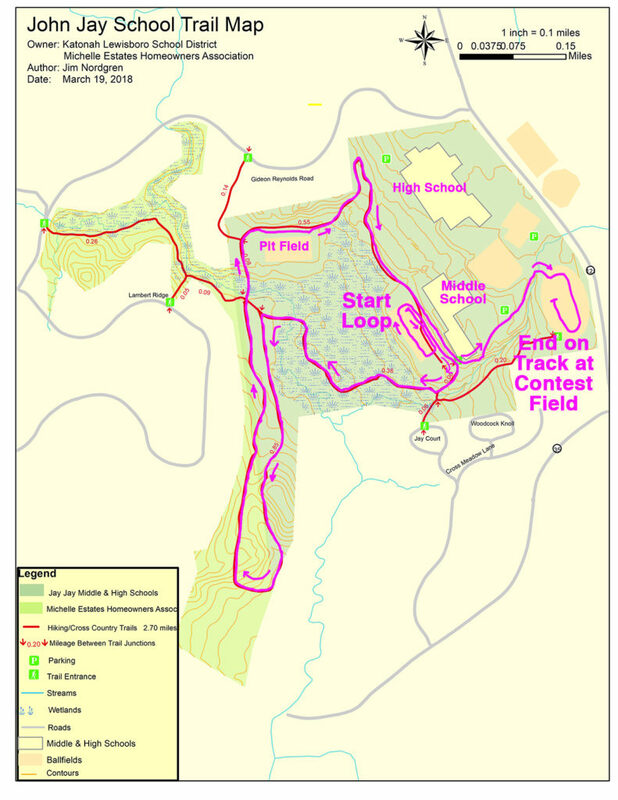 Course description (map below): The course starts in the middle school field where runners will loop around once in order to stretch out the field a bit before going into the narrower trails. Runners enter the trail by the challenge course (towards the Meadows condo complex). The trail turns right immediately downhill. Runners cross over the bridge and then turn left towards up the trail & hills and then follow the loop around to the second bridge. After the second bridge runners climb the trail up to the pit field. After the pit runners will go through the nature trail on the left hand side of the fenced pond and then up to the dirt student parking lot. Runners head through the parking lot and down the hill again to the middle school field (the start area). Runners will turn uphill on the trail next to the middle school and head up up past the basketball court and into the main entrance of the John Jay Contest Field (the one with the track). Click here to see photos and video from the trail clearing, planning, construction, opening – and after the race – we will have race photos! John Jay Cross Country at Croton Point Park after their sweep of the Westchester County Championships (Girls Varsity, Girls JV, Boys Varsity, Boys JV) in October 2017.